"Parents and Children Together: Making Physical Activity A Shared Activity" by Dana Rosenbloom, M.S. Ed. - Energetic Juniors - Contact Us! “Parents and Children Together: Making Physical Activity A Shared Activity” by Dana Rosenbloom, M.S. Ed. The article focused on ways to get children moving. Certainly, opening the back door to let the children play in the yard is not an option for the most part in New York City where I reside, but truly, my clients throughout the country talk about children who seem “addicted” to electronics and don’t want to go out and play. I’ll save my thoughts about technology for another post, but I think it is worth discussing the idea of role models. In education, we talk about the parent as the child’s first and best teacher. That’s not simply about academics, it holds true for managing emotions, resilience and activity level. Parenting isn’t easy, and given that we’re in the middle of the Winter, getting outside to model activity may not be easy either. That said, what is the message you are giving your child about how you value physical activity? Do you take the stairs to the 2rd floor of a building or the elevator? Do you spend your days on the weekends on your technology, as they’d like to, or do you model time management and creative ways to stay active (even if it’s indoors…and only some of the time)? Now clearly Energetic Juniors is the expert in this area, but here are a few easy ways for parents of young children to incorporate activity into each day (or even every other day). Make an obstacle course in the house using pillows and cushions from the couch, painter’s tape, and any other items you have around. Play a puzzle. Put the pieces at the bottom of the stairs and either place the board at the top of the stairs, or construct the puzzle there. Try a yoga app. Super Stretch Yoga is one of my favorites for young children. Or include them in part of your daily practice. Act out a book, rather than simply reading in a chair. I love the Rufus Butler Seder books for this or Sometimes I Like To Curl Up In A Ball. Have a dance party. Laurie Berkner and Big Block SingSong are favorites for the children I work with. This is also a great way to share your favorite music. Take a walk around the block. Let your child bring their bike or baby stroller. Somehow they don’t feel the cold like we do. Try animal walks for transitions like washing hands in the bathroom and then going to the dinner table. The children choose what kind of animal they’d like to move like. 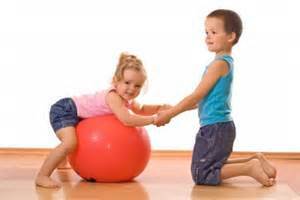 Children can take turns with siblings, friends or their grown ups. Bear walks are not for the faint of heart…or out of shape! You can do this. As always, a friendly reminder that you don’t have to do it alone! If I can help you accomplish the goals you have for yourself and your family, please reach out. You deserve to feel competent, joyful, and EMPOWERED, when you are with your children. They should feel self-confident and have the opportunity to reach their fullest potential. I can help you do that! GET STARTED NOW!